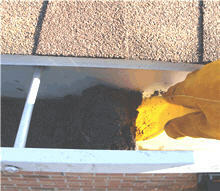 It is typical for granules to shed from the roofing and deposit down into the gutter. Usually this happens after a period of years. However, when this begins to build up over a period of time, passing water is slowed and other particles collect in the grains. The gutter is quicker to overflow. And, since weight is being added, attachments holding the gutter begin to loosen - once the nail attachment relieves, it looses it's holding power. Wear gloves and begin, with a 2 1/2 " plastic putty knife (larger for oversized gutters). Scrape loose any hardened or compact base of the pilings as you advance toward an end. Shoving everything successively forward. The knife will have be held, to move it with force. Though watch for any metal cuts inside the gutter. The main obstacle being the nail slots. You will want to base your chosen direction on: the amounts collected in the basin, the obstacles obstructing the ladder, the length of the run and where the downspout port(s) are located. Being mindful NEVER TO SACRIFICE the safety of ladder positioning in favor of expected progress. Lift the pilings out with a the knife held level (on a windless day!) and pour them into a 2 gallon plastic bucket. Quickly dust the rest that exist with an old paint brush. A brush is lighter and easier and far less cumbersome than a powered vacuum. The particles can be dumped to a larger 5 gallon bucket as the smaller one fills. Or use a couple of 2 gallon buckets. Rinse the length of the gutter with the pressure nozzle of a hose. Again using extreme caution. If a lot of weight has been removed you might want to get a qualified roofer to comment on loss of shingle granularity.